This driving tour of the upper South Island includes two fantastic rail journeys that take you along the edge of the Pacific Ocean and across the spectacular Southern Alps. Along the way you will also see some of the hidden gems at the top of the south including the Pancake Rocks at Punakaiki, whales in Kaikoura and the fascinating Denniston Mine on the rugged West Coast. A must for train enthusiasts, this tour will see you enjoying breath-taking scenery in unique and inspiring locations. You can expect to spend around NZ$63 in fuel cost on this itinerary based on an intermediate sized car. The Coastal Pacific train journey travels between Christchurch, the South Island's largest city and the delightful port of Picton. This journey is a scenic feast of New Zealand, with the Kaikoura mountain ranges on one side of your train and the rugged Pacific Ocean coastline on the other. 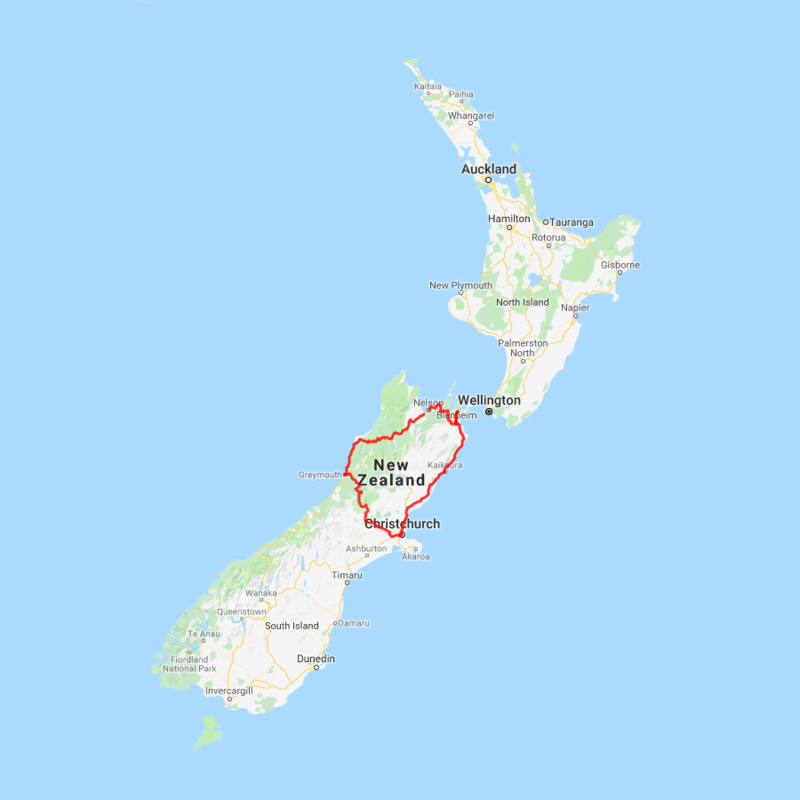 The Coastal Pacific travels through 22 tunnels and crosses 175 bridges - one of them being New Zealand's only road-rail bridge. The Coastal Pacific includes an open-air viewing carriage where all your senses are awakened with the clean and fresh sea air. This leg of the journey crosses the wonderful North Canterbury countryside to the township of Kaikoura. Kaikoura offers dramatic landscape scenes of mountains meeting the sea. Kaikoura is world famous for its resident whale population and whale-watching tours. The more adventurous traveller might wish to get closer to marine life and swim with the dolphins. The Coastal Pacific train journey travels between the delightful port of Picton and Christchurch, the South Island's largest city. This journey is a scenic feast of New Zealand, with the Kaikoura mountain ranges on one side of your train and the rugged Pacific Ocean coastline on the other. One of the world's most scenic train journeys, the Coastal Pacific travels through 22 tunnels and crosses 175 bridges, one of them being New Zealand's only road-rail bridge. As on The TranzAlpine, The Coastal Pacific includes an open air viewing carriage where all your senses are awakened with the clean, fresh, sea air. Heading south from Picton you soon arrive into the grape growing areas around Blenheim. Famous for their sauvignon grape variety the region is the largest in New Zealand. Many of the wineries welcome visitors to their cellar doors. Heading south west you pass the airport and here you will also find the Omaka Aviation Heritage Centre, which is well worth a visit. A short drive north from Blenheim to you reach Havelock. The small port town of Havelock has a great variety of cafes and restaurants to choose from so plan your journey to arrive in time for lunch. Crossing the Bryant Range you arrive onto Tasman Bay and the city of Nelson. Omaka Aviation Heritage Centre houses a display like no other and you don't have to be an aviation buff to enjoy it! Human stories from the Great War come to life in a theatrical treatment, which is innovative and visually stunning. Captivating scenes depict the aircraft in context, some recreating actual incidents. The rare memorabilia is worthy of any national collection and ranges from beautifully crafted 'trench art' through to personal items belonging to the famous Red Baron himself. The World of WearableArt™ and Classic Cars Museum is an iconic ‘must see’ Nelson visitor attraction that celebrates two distinctly different passions. A world class collection of classic cars can be viewed alongside incredible wearable works of art from all around the globe. This unique visitor attraction means you can enjoy the special World of WearableArt™ experience even if you can't make it to the annual performance. All the garments on display have performed on stage in the annual WOW® Awards. The magical experience of the annual awards show is brilliantly translated to the gallery setting by the use of superb music, specially sequenced lighting and a cleverly introduced element of movement. Here you will truly appreciate the intricate detailing of these incredible creations up close. The car collection represent years of passionate sourcing from around the world and New Zealand. These cars are some of the most sought after models in Classic Motoring, presented to the highest standard, with some having undergone extensive restoration. As well as being classic examples of automotive technology, these cars tell an important story about the twentieth century. They represent the spectrum of automotive history, design and craftsmanship. This is one of Australasia’s largest private collections. The museum’s distinctive building features a six-metre high metallic aluminium ribbon wall that is based on a dynamic wand and silk taper performance in a previous WearableArt™ show. The aluminium fabric flows and twists like the original fabric. The museum also includes a café with fine food made fresh every day and superb locally roasted coffee which you can enjoy inside or out beside their tranquil pool.